It’s been a while since I’ve done one of these, but I thought it would be a good idea to do one now that all of the major decks in standard seem to have been established. We have an incredible amount of removal spread throughout each color in standard at the moment, but the biggest challenging is deciding which combination is the most potent. Today I’ll be looking at all of the removal available to us from Khans of Tarkir to Battle for Zendikar. Sure we only have about 5 more months of KTK and FRF, but that’s still a lot of time for those cards to do some damage. The types of removal I’ll be talking about today are board wipes, spot removal, burn, tempo, enchantments, and creature/planeswalker based removal. At the moment, my current favorite boardwipe is Planar Outburst. It does what a control decks wants it to do (kill all creatures), and since it doesn’t discriminate between what it kills, I find it better than Crux of Fate. 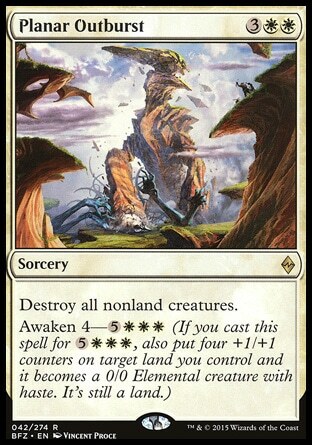 As we get more man lands in the next set, I think it will only get better in control. I’m looking at Jeskai and Mardu control as top contenders in the next block alongside Esper Control. Outside of white based control decks, the next best board wipe is Crux of Fate. It gives decks like UB control or GB Ramp an answer for big creatures. We saw a lot of play from Tragic Arrogance during Magic Origins standard when most decks were creature-centric, but with the addition of multiple planeswalker decks (Gideon, Jace, Ob Nixilis, etc) it suddenly became a lot more tricky to use. I don’t think it’s the end of this card though, but it will be a while before the meta shifts in its favor again. Sideboards in BFZ standard got a huge boost over past metas. Languish, Radiant Flames, Seismic Rupture, and Windstorm are all seeing a decent amount of play in sideboards these days. I personally never thought I’d use Seismic Rupture but it’s been a great card in my GR ramp deck against aggro decks like Atarka red and BW warriors. Windstorm has also been good against Dragon based decks. Abzan Charm continues to be one of the best pieces of spot removal in the format. It gets rid of any menacing creature in the format for good while also giving you access to great tempo effects and card advantage as well. It’s great against any match up except for aggro decks like Atarka Red (but even then it still comes in handy if your opponent goes for a kill with Becoming Immense). Utter End is another great card in this format now for both Esper and Mardu decks and is indispensable against planeswalkers like Gideon and Eldrazi like Ulamog. I think it will continue to see a lot of sideboard play in the coming weeks and maybe even some mainboard play depending on the meta. Dromoka’s Command and Murderous Cut also continue to see a lot of play. The mana is so good with fetchlands and BFZ duals that I expect Cut to stick around right up until the end. It’s also a great card for decks like Aristocrats/Rally that fill up their graveyards quickly. Dromoka’s Command still has around one more year, and like the other commands, it’s modes are useful in a variety of different situations. It will continue to see a lot of play in the upcoming months. Just as with board wipes, spot removal also has some really good cards in the sideboard. At the moment I think Surge of Righteousness is underrated and will see a lot of play in the coming months. It’s great against all the aggro decks running around (Atarka Red, BW Warriors), and also is pretty useful against Jeskai decks. 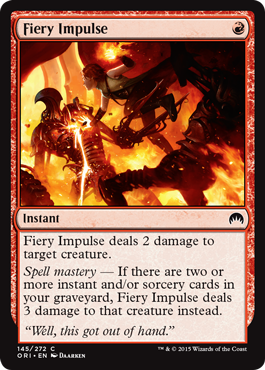 While it doesn’t hit players, you can’t deny Fiery Impulse’s effectiveness. It’s great early game against aggro decks and ramp, and after a few turns it can take down a Mantis Rider. Draconic Roar is probably the better burn spell, but there haven’t been too many red based dragon decks since Mardu Dragons. I expect dragon decks to make a comeback after Khans rotates, and with it Draconic Roar should rise with it. I’ve seen a lot more players using Mardu Charm recently instead of Crackling Doom in various decks. Sure you’ll still want Doom in a Dark Jeskai deck because your other removal is more than adequate, but Mardu Charm’s modes get better and better as the metagame evolves. It kills big creatures, gets rid of Ugin before it can be played, and gives you creatures to use as you will. Roast also finds itself being used quite a bit in sideboards against decks like Abzan aggro, melting cards like Siege Rhino and Anafenza, however for some reason Exquisite Firecraft has actually seen less play these days in favor of more flexible removal. There aren’t really a lot of good tempo cards at the moment, but the most widely used tempo/removal card is Self-Inflicted Wound. While it’s not what you’d consider to be a traditional tempo card that “bounces” something back to an opponent’s hand, the card still can have quite the effect when played early to stop an opponent’s assault or to change the tides of the game into your favor. It’s played in most black based sideboards to deal with Abzan or GW megamorph decks, but I’ve even had it used against my GR Ramp deck to get rid of my mana creatures early. Crackling Doom used to be king of burn/removal, but with the metagame shift to more aggro and faster decks means its effectiveness has been downgraded. Foul-Tongue Invocation is another sacrificial card that has seen a resurgence since Esper Dragons has regained its former power. 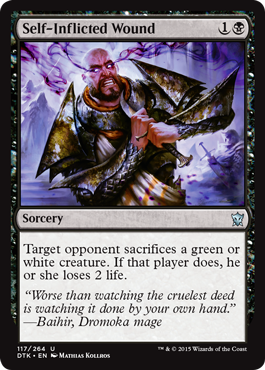 The card is a little less powerful than Crackling Doom or Self Inflicted Wound which can at least “roughly” target creatures you want to get rid of, but that really doesn’t matter in a control deck that has access to other types of removal. 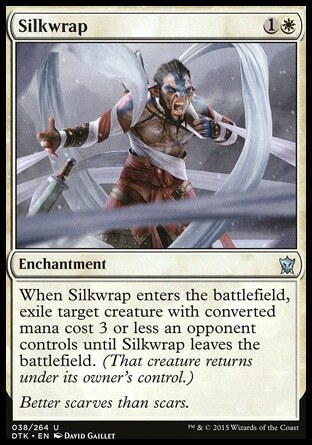 Seriously, who would have thought that Silkwrap would become one of the premier removal cards for white back during Magic Origins standard? Don’t get me wrong, it’s great for the metagame since it deals with all of those fast decks playing Mantis Rider, Hangarback Walker, or Anafenza, but it could easily get taken out by cards like Dromoka’s Command which sees quite a bit of play. I think it will continue to be a great removal card until Mantis Rider and Anafenza rotates, but after that I don’t think it will be sticking around. Stasis Snare is another enchantment that has seen an uptick in play recently thanks to the popularity of BW Ingest decks using Wasteland Strangler, and when Ugin rotates I expect that card and Quarantine Field to only get stronger. It’s a close call between Ugin and Ulamog, but only Ulamog can take out an Ugin so the scales tip in favor of our newest Eldrazi overlord. 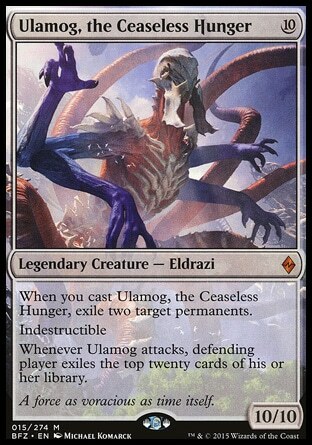 Ulamog has been amazing in the current metagame in the Eldrazi ramp strategies. Being able to play an Ulamog every turn to take out an opponent’s permanents (thanks to Sanctum of Ugin) makes him incredibly powerful. He’s only going to get better when his buddy Kozilek and Emrakul are reprinted in standard, so you better be prepared to deal with him or be prepared to be outclassed, outgunned, and overpowered. Ugin is still and will continue to be the best planeswalker in standard until he rotates out in Spring next year. The card deals with just about everything you can throw at it, but as of late he’s been used more as a board wipe to humiliate greedy Abzan and Jeskai decks that try to kill you around turn 5 or 6. Speaking of planeswalkers, Ob Nixilis is finally seeing more play in standard thanks to the success of decks like Esper Tokens and Mardu Superfriends, and I expect he’ll be showing up in even more decks after KTK and FRF rotates. He’s a distinct upgrade over Sarkhan, the Dragonspeaker thanks to his kill anything ability even though Sarkhan is more aggressive. Sarkhan is nice in those aggressive Jeskai decks at the top of their curve, but it’s kind of too little too late. I expect him to leave standard with a whimper, not a roar. The Dragonlords, namely Atarka and Silumgar are due to get a huge boost after rotation. Atarka hasn’t seen much play outside of GR Eldrazi ramp since his days back during DTK standard alongside See the Unwritten and Xenagos the Reveler, but I expect him to make a big comeback. Silumgar has been showing up in more and more sideboards outside of Esper dragons lately, and I believe it’s because of cards like Ugin and Ulamog. Silumgar allows decks like Dark Jeskai, which are weak to those cards, to steal games from opponents who think the match is locked. Both dragons are huge tempo swings when you play them. As for the other creatures seeing play currently in standard, one that stands out in the most is Hidden Dragonslayer. It sees play in only a few decks, but this card is only going to get stronger as more and more player use behemoths such as Kozilek or Atarka to end games. GW and Bant Megamorph will have a decent amount of their cards sticking around after rotation, and I think the Dragonslayer can become a staple of white decks in the future. Other cards, such as Pia and Kiran Nalaar, or Wasteland Stangler should also see an uptick over the next few months as BW Ingest and Mardu/Jeskai token decks come out to play with Ugin gone. We are currently in one of the worst standards for removal ever. The cards work and get the job done, but they are simply not efficient most of the time. Not being able to direct a Draconic Roar straight at a player, or allowing a Siege Rhino to hit you for 4 damage every turn because your Silkwrap can’t touch him can be extremely frustrating. 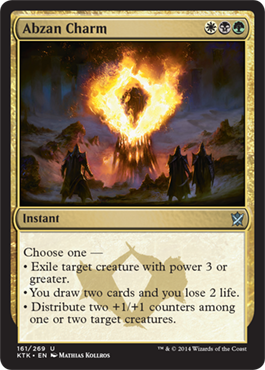 The best removal we have at the moment are 2 or more colors (such as Crackling Doom and Dromoka’s Command), but I think as soon as Khans of Tarkir and Fate Reforged leave standard that mono color removal will get much, much better. Without all of the ‘gold’ creatures running about, Ultimate Price will be downright deadly, and if we’re lucky we’ll get back cards like Tragic Slip and Victim of the Night in the Shadows of Innistrad block. I just ask that you bear with it for now. We’ll be out of this free for all in no time, and have plenty of answers for troublesome cards in future metagames. Only 1 more month until Oath of the Gatewatch comes out! If there are any other cards you think should be included in these lists, feel free to add them down below and to tell me why you suggest it. Thanks for reading and see you next time.